I love my pets, but let’s be honest, dog food is not glamorous. I am constantly trying to find ways to hide it or conceal it when we have guests over, and nothing ruins a good day quicker than accidentally stepping into or knocking over a dog bowl in the middle of the dinner rush. We love our pets like family, so why not give them a place to eat that is as beautiful and comfortable as your own kitchen table. Rather than hiding it in the corner and hoping your guests don’t notice, make it a beautiful part of your home. 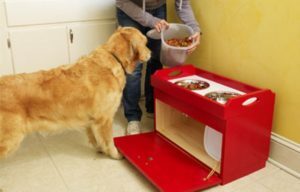 Here are several DIY pet feeding stations that you, and your pet can be proud of. 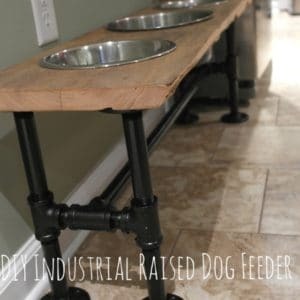 This is a great option for bigger dogs or families with multiple dogs, because you can make it as big or as tall as you need. The industrial pipes give a rustic look, complimented by the farmhouse style wood plank and stainless steel bowls. The bowls easily pop out, making for easy filling, feeding, and cleaning. 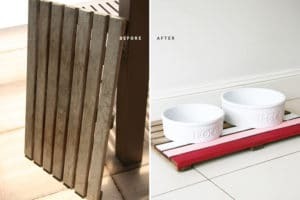 This charming dog tray is a DIY option from This Old House that has a door on the front to make available food storage. I love the bright red color, but you could also keep it natural wood looking, or paint it to match your current kitchen décor and style. This is one of my favorites because it looks like a true built-in, utilizing an existing countertop overhang. If you’re worried about resale, you could swap out the bowl shelf with a solid shelf used to store cookbooks or canisters. 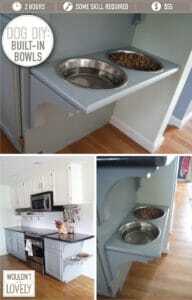 Create an entire doggie destination with feeding bowls, bins for toys and storage for food and treats. Everything your furry friend needs in one spot that is organized and beautiful. It doesn’t get any better than that! 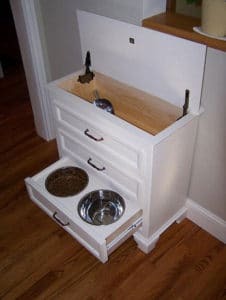 This thrifty couple made a dog feeding station out of an old dresser! Hinges convert the top of the dresser and adding metal bowls into holes cut from a jigsaw make the bottom drawer perfect. 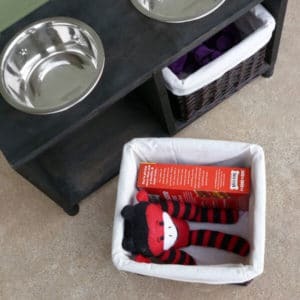 Middle drawers can store toys and other pet supplies. This is basically an elevated dog placemat that prevents bowls from slipping and sliding around the floor. I love the style and the colors she used on this old duck board. A similar style could easily be created with paint sticks or a pallet.